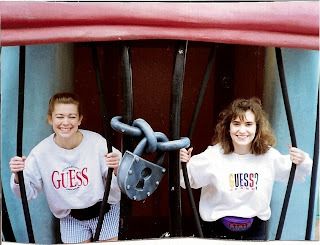 The Loves of Jenn: Happy Birthday Randi!!!!! How do you tell your best good friend that you love her on her birthday? 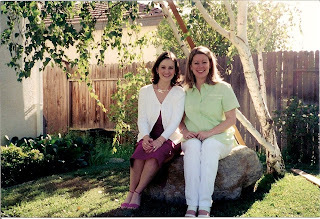 Scan OLD and embarrassing pictures of her and post them on your blog of course! I'm sure most of these pictures will be just as if not more so embarrassing for me but here goes. I've known this girl for 18 years. 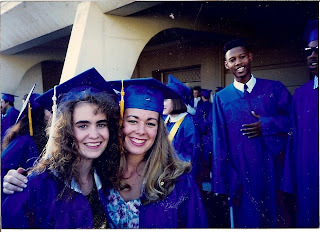 She was the new girl from Oklahoma that transferred to the huge school that was BHS back in 1991. We met in dance class and the rest, as they say, is history! Some of my greatest moments and adventures in life have happened when she was right by my side. 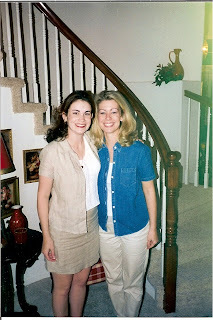 We've lived apart for 10 years now but are still as close as ever. Every time we get together it's like nothing has changed. 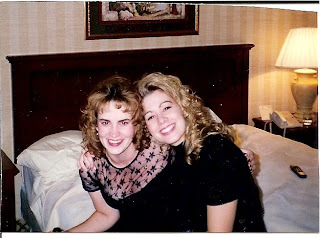 Deep down we are still those two silly teenage girls (but now with better hair and clothes...you'll see what I'm talking about in a minute). 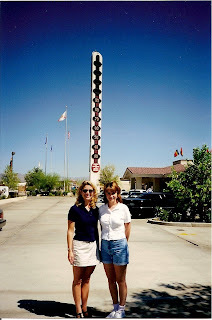 Who doesn't have a picture in front of the big thermometer on the way to Vegas? She was such a good sport when I hired her a stripper for her bachelorette party (this is the only picture I could post of that evening)! See, I told you it was her signature move! 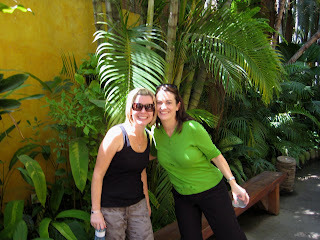 And, just in case you wanted to see a more recent pic....here we are just a few weeks ago in Mexico! 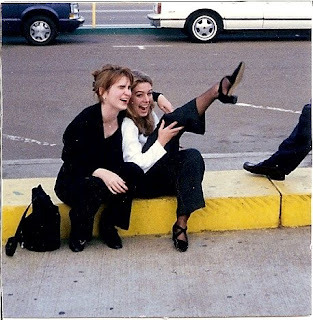 Now, if only I had an embarrassing picture of Randi doing that thing she used to do that made me call her Gumby. Oh wait.....I do! You're the best friend a girl could ask for. I always wanted a sister and I finally got one...when I was 15. 1991 was a good year for me. I found you and Shaun! I love you friend and hope you have a wonderful birthday! Wait a minute while I wipe away a few tears! We have had some wonderful times and you mean the world to me! Thanks for all of the things that you said and for the trip down memory lane. I am so lucky to have found a "sister" in you as well. One thing is for sure; my life would not be the same without you! Wait, make that two things....I am not a flexible as I used to be! Sniff. I want a Randi. Where can I get one? What a sweet post. You are blessed, indeed. I just wanted to pop over and say hi and thanks for "delurking" on my recent post. It was originally just intended to out the anonymous person who, basically, told me to rock Seth more, but I'm haivng fun seeing who my other "regulars" are, too! I'll be back to read more of your blog, too. Your daughter is a gem! So beautiful.